The entrance to the Darr Motel off of Highway 395. Coming home Sunday from Barstow, I ended up in the dreaded traffic backup at Kramer Junction. After about an hour of stop and go a break was required; so my truck and I pulled up in front of the antiques dealer just north of the tracks on State Route 395. I looked forward to resting and recharging my soul with some antique mystique. 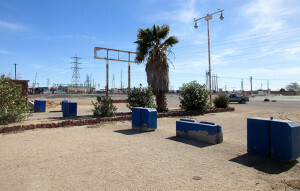 Kramer Junction was originally west of its current location on Highway 58 out by Boron. When the 395 crossed the current 58, the historical four corners became a reality. All that was needed was an owner who could see the potential of this desert crossing to make it flourish. Many of us AV residents have been over these roads many times. Even back in my Air Force days, I remember the stops at Astro Burger on trips to and from Cuddeback Dry Lake from George Air Force Base. Today, the busy desert hub still looks a bit like it did in the past, but one particular aspect of the corner came to light when a conversation was struck up with the owner of the antiques business. I was thankful for his wanting to share a bit of his family’s history at Kramer Junction. Dennis Darr and his family are pretty much the reason Kramer Junction looks the way it does today. Many years ago, Dennis’ father ran a Standard gas station at Muroc/Edwards Air Force Base and owned some of the land around it. When Pancho Barnes was fighting with the military over the fate of her Happy Bottom Riding Club, Mr. Darr saw the writing on the wall. He took the opportunity and sold his interest at the base for a fair amount of money and proceeded to buy up all the land around Kramer Junction. With the purchase of the land, it wasn’t long until a gas station opened, with supplies and services to support the desert travelers heading north and south, east to west. One amenity was lacking — and in the late 1940s/early 1950s an opportunity came calling and the much-needed Darr Motel found just the ticket it needed to become a reality! 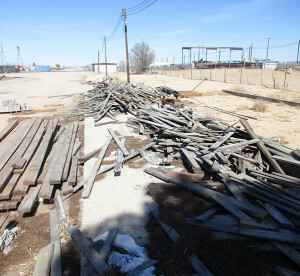 The foundation for a military duplex and the wood that made a home for officers at Edwards Air Force base and weary travelers on a highway, looking to be repurposed in new projects at Kramer Junction! Ten officer duplex facilities from South Base, or Kerosene Flats, on Muroc/Edwards were going to be demolished, but a deal was struck and Mr. Darr had the buildings for his new motor lodge at Kramer. Now came the challenge of getting them there! In nearby Rosamond, the Pauley Brothers had an operation capable of moving buildings. So Mr. Darr partnered up with the brothers and one duplex at a time could be seen up on wheels rolling across Rogers Dry Lake, circumventing the desert on narrow rutted roads all the way out to the Junction. 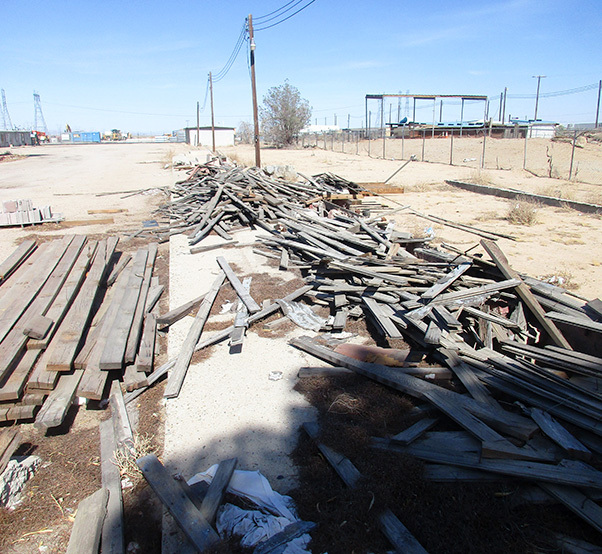 This played out eight times, as a total of eight duplexes made their way across the desert, with two others finding their way to Boron. 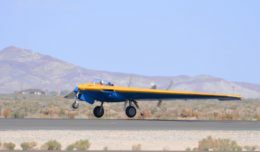 What a great piece of High Desert history unfolded over that time period. We can only imagine the stories these buildings could tell, not only of their service as that motor lodge, but also the years spent housing the Air Force brass and their families in the early days of flight test and military operations. Nowadays the Darr Motel is just a shadow of its former self, but it still stands against the harsh sun and wind of the Mojave Desert. Passers-by know little of the buildings’ history in the area and their connection to the family that made the desert crossroads an oasis for many a weary traveler over the decades. I searched in vain for a photo of the location back in its glory days, but found nothing — but I will keep looking for that postcard that surely must be out there somewhere and is waiting to be discovered! For now, I just have some present day photos that will feed your imagination. It makes you think: if ghosts really do exist, then this desert oasis in the middle of the night must have quite the diversified guest list, from the high-ranking military man to the lonely old salesman weary from a long trip on an old two lane highway, between points A and B on a map. If you’re passing through someday, take the time to stop across the street and get an Astro Burger and then seek out a member of the Darr family next door at the antique store. Ask them to share the story in person of a place that I’m sure has many more tales then I know of! All I can say is I’m sure glad I made that stop, because you never know when the rest stop will turn to gold! Highway gold, that is!